Watched the 2012 Canadian mocumentary movie, The Conspiracy. It is kind of wordy but pretty interesting. Check out the video for the full review! Willow Creek (2013)–Bobcat’s Bigfoot Movie… And It’s Great! Today we look at the Bobcat Goldthwait directed Bigfoot movie, Willow Creek! Just thought I’d share the fact that for the first time since I set this blog up, I have had more visitors from Spain than any other country, today. Welcome and please tell your friends that they are welcome here also! It was a toss up as to whether or not we were going to watch Alien or Deadly Spawn. My buddy made the argument for Deadly Spawn as it is a much less known movie, and I went along. Watch this film, my friends! 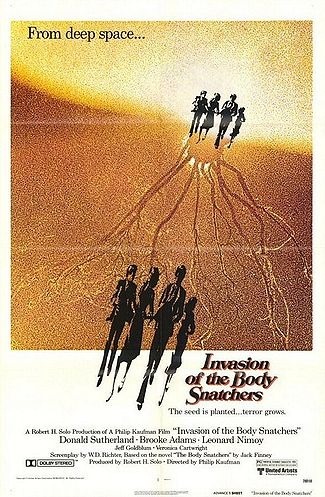 1978’s remake to the 1956 classic movie, Invasion of the Body Snatchers is in itself a true classic of Sci-Fi horror. 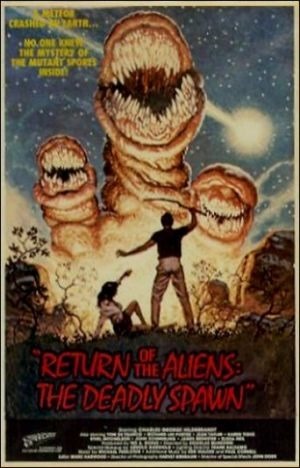 Starring Donald Sutherland, Brook Adams, Leonard Nimoy and a very young Jeff Goldblum (among others), this great casted movie tells the story of an Alien Invasion of a most insidious sort. You see, and alien life form has appeared as an attractive flower… Only problem is the flower eventually creates a duplicate of yourself, while you whither and die. New York is now full of Zombie like individuals, who seem to be able to communicate without the need of verbalizing. Friends and family members, not yet infected are reporting that their affected loved ones seem to have been replaced, and that only the outside resembles them. The infestation spreads exponentially, and the unconverted are hunted by the converted. Some have learned that you can fool the duplicates if you keep to yourself, and show no emotions. Of course, how long can someone go on like that? Invasion of the Body Snatchers does a good job of creating a very creepy mood, with a combination of filmography, great casting and a fantastic use of ambient sounds and anxiety creating music. I think another reason this movie seems scarier than most (to me at least), is that the people affected seem like real people and not just characters on a page. Also, the fact that it all takes place in a normal cityscape and not removed in space or in the far future makes it seem just that more real. If you like Sci-Fi and Horror then you’ve got to watch this one. Easily one of my favourites of this genre,, I have watched it many times and will watch it many more tomes before this mortal coil is done. Also, if you like this one, definitely check out the original, too as it also ids a fantastic story/movie. Having just watched Slither (again),last night and remembering the outcry from a lot of fans of the classic 1986 Night of the Creeps due to the many similarities between the two movies, I just had to watch Night of the Creeps (again), tonight. 2006’s Slither does something very difficult: it manages to mix horror with Science Fiction (Sci-Fi), and adding a large dose of comedy…and gets it all right. I’ve reviewed the move in the past (here is the original, tiny write up: Slither 2006). It was so good, that I decided we should watch it again, and maybe put a little more effort in the write up this time. Well, you see, Grant is now the host of an alien intelligence who spreads through taking over individuals, either through assimilation or through infection via a parasitic worm/slug like form. The creature can also use a life form as a host to breed the aforementioned worms/slugs…and it does – boy does it ever. Of course this turns in to a battle of a few against a lot, and is tense and action packed… as well as a lot of always cool grossness. The creature design is fantastic, and the whole cast does a great job in creating what feels like a heartfelt homage to the alien invasion/creature films of the 1950’s and 1960’s. This is a great Sci-Fi/Horror/comedy that I strongly suggest you check out. Win a Very Special Edition Of The Toxic Avenger… The Easy Way!! !